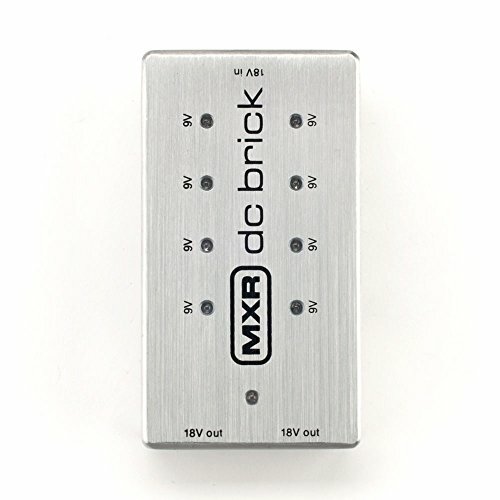 Keep your pedals powered with the MXR DC Brick Power Supply. Featuring eight 9V outputs and two 18V outputs, there's power enough to supply virtually any combination of effects. Each 9V output has an LED that will illuminate if there is a short, so you don't have to guess. Of course, there is ample short-circuit and overload protection so you don't have to worry about that either. Included in the box is the AC adapter and all the cables you need to get going. Since 1972, MXR has been a pioneer of the effects pedal market with the revolutionary development of tough and rugged stomp boxes, simple utilitarian designs, small sizes, and 100% rich analog tone. Today Dunlop continues MXR's traditional pedal line of original MXR classics that has come to define the brand, as well as new modern classics like the Carbon Copy and Fullbore Metal. However, MXR has never stopped innovating and continues to inspire with award winning designs. MXR Bass Innovations has recently released the Bass Octave Deluxe and Bass Envelope Filter. The MXR Custom Shop faithfully resurrects recreations of the long-lost vintage models such as the hand-wired Phase 45, as well as doing limited runs of pedals featuring premium components and highly modified designs such as the new Custom Comp. Located in Benicia, California, Dunlop Manufacturing, Inc. was founded as a small, family-owned and operated company in 1965, and has since grown to be a leading manufacturer of electronic effects, picks, capos, slides, strings, and other musical instrument accessories. Dunlop is the home of such legendary products as the Crybaby wah and Tortex picks.